I'll never relent on pestering for this feature. NEVER!!! It's not only essential for my game, but I can't imagine how anyone could expect to implement a proper list of custom item features--such as are allowed via the use of variables--without being able to communicate those features to the player. For goodness sake, as it stands we can't even disclose how much an item weighs--we can define a weight by creating a variable, but we can't tell anyone about it. Not without simply making it a static, predefined variable and listing it as part of the description. Also, since we're on the topic, Ability and Object variables are *nearly* as important to display, but Item variables at the very least are absolutely essential. ESSENTIAL, I say! Please, don't make me create a Twitter hashtag. I'll do it--I will! Don't think that I won't. I'll even go so far as to incorporate something about Donald Trump, so that everyone on Twitter will see it, and they'll all know that ORK's current framework doesn't allow them to display their narcissistic variables to the rest of the world that doesn't give a damn, because everyone's too busy shouting #metoo. You see where this is going. "I made a really awesome variable for my item, but ORK censored me and wouldn't let me show it to anyone," they'll all say. And it will trigger them. And, when the #PowersThatBe run out of B.S. to force feed #WeThePeople in an attempt to keep us passive and distract from all the evil #$&% they're really up to, they'll order their cronies to flash something about the Twitter hashtag on news teleprompters across the globe, and anchors on CNN will read those teleprompters and suddenly break down, hugging each other and crying about how life simply isn't fair. And who's fault do you imagine it will be, that life isn't fair? If nothing or no one comes to mind, just wait, and rest assured that you'll soon have an answer. All the news channels will begin making veiled comparisons between ORK and #TheRealHitler. Then, not so veiled. They'll all start shouting about it--asking how something like this could ever be allowed to happen and pleading for something to be done--over, and over, and over they'll just #bitchandmoan about it on the airwaves ad nauseum. Every day. Constantly. Pounding that incessant narrative into our saturated collective brains until somehow we forget that those people with the talking heads we've been listening to are not just every bit as ridiculous as they are #BatShtCrazy, they're also... well, I forget, but something needs to be done about this issue. I don't know why ORK won't simply allow us show whatever variables we select to whomever we expect might actually care. Personally, I blame Russia for the appalling deficit, but that's just me stating the obvious. What I do know, is that before long (pending the hashtag, of course) certain people in high places are going to start pointing to random countries on a map and saying that they're the one's who are actually responsible, and the next thing you know we're wasting tens of thousands of perfectly good munitions to destroy those random countries when we haven't even finished destroying all the other random countries we're currently working on destroying! It's just pure insanity, and no one wants that... I mean, something like 99.999% of people probably don't want that, if they're being honest with themselves. Hey Wanda would you be interested in a scripting solution? I'll experiment with something like that tomorrow and share the results if I can manage it. Okay so I dug around a bit but I'm having a hard time finding the exact location and means of access for the BonusSettings on a weapon. If we can find out how to pull up the array or dictionary that has the properties we need, we can make a simple script with switch statements that can save the strings/numbers to ORK global variables and then display them in any menu. I'll dig through old scripting posts to see if I can find examples. If not, GiL will be around sooner or later to show us. Thanks, Klep, for offering a lifeline on this issue. As far as a scripting solution goes, I mean I'll take whatever avenue might be available to implement this functionality--there's always a work around--but I do honestly feel that this should be a core ORK feature. It would greatly benefit the program, and its users, to be able to access every type of variable from a selected source. It can't be that far of a stretch to make a connection to these variables, especially seeing as we can already display the core parameters of individual items, such as their Durability. That said, I'll suspend my nuclear Twitter option... for now. 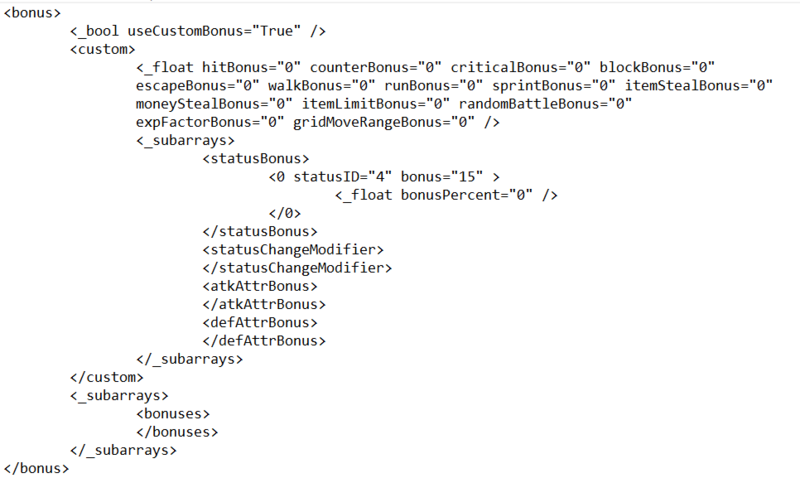 Okay so I actually read through the source code itself and found the "BonusDisplay.cs" and "BonusSettings.cs" classes. They both inherit from the BaseData class. I think I'm pretty close to a solution. But even if there is _no_ way to access the data we need with a built-in function, we can still build the system you want. There's a number of ways to go about it. Getting closer to a solution. So I just need how to pass the data from the XML to a variable. After that, we should be able to add them to descriptions. Alright got the next step. returns True, meaning I'm confirming the presence of a float value at the Root node of the Short Sword's data object. Now I just need to find the exact syntax to enter the node path correctly. Rejoice, ORK 2.19.0 has finally added using ability/item/equipment variables in their respective descriptions! I'm--(sniff)--I'm just so happy. I love EVERYBODY!! !